Open to everyone in the community; not just University of New Brunswick alumni, Homecoming 2015 is taking place next week (Sept. 24-27). Registration closes on Sunday, Sept. 20. 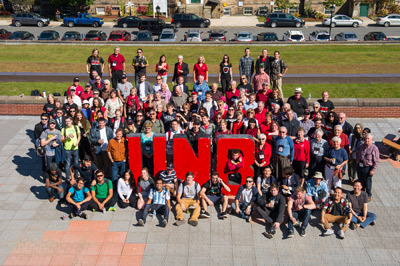 Everyone is encouraged to come to campus and celebrate all things UNB! For more information, contact homecoming@unb.ca or 506-447-3218. Looking for something to do with the kids on a Saturday morning? Family FunFest is a homecoming event that gives families a chance to enjoy the UNB campus and experience a morning of fun and discovery. Saturday, Sept. 26, at 10 a.m. is when the fun gets underway. Fredericton’s own, Scotty and the Stars will be playing. There will also be bouncy castles, face painting, sports with UNB Varsity Red athletes and much more! Admission is free, but registration is requested. A homecoming favourite and a truly red n’ black experience, this year’s Tasting will take place on Saturday, Sept. 26 at 8 p.m. in the SUB. An assortment of wines, beers and other fun drinks will be available – some of which are produced by our own UNB alumni! Tickets are $35 and sell out quickly. You must be 19 years or older to attend. Friday, Sept. 26, 1:30-3:30 p.m. In the Wu Conference Centre we will be giving the community a crash course with UNB’s top experts. This event will help showcase some of UNB’s top research initiatives and demonstrate why UNB was recently named Canada’s Most Entrepreneurial University by Startup Canada. Admission is free, but registration is requested.